So what is the deal? 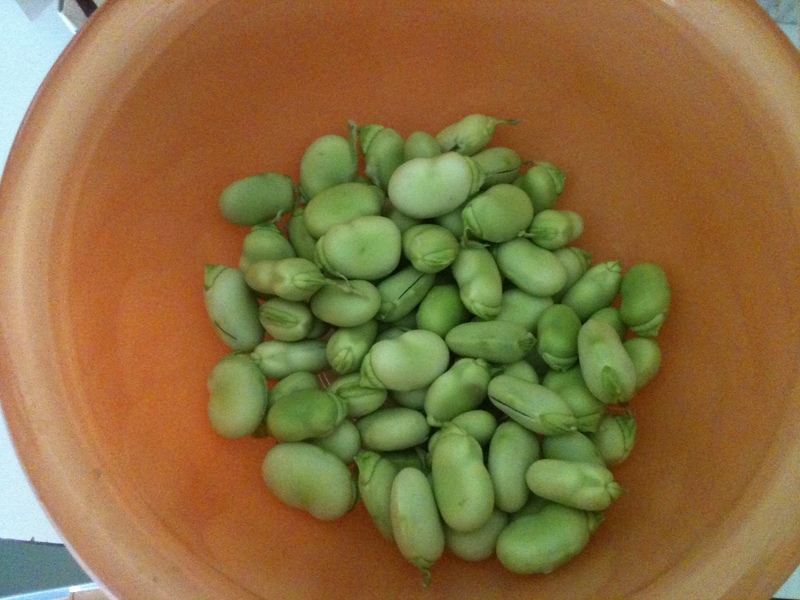 Why do you avoid fava (or as our Brit friend’s refer to them, ‘broad’) beans? Is it the intimidating size of their pods? Was it a bad experience trying to eat them with the outer skin on (opps, no one warned you)? Have you been too lazy to shell a bean not only once, but twice? Or was it Antony Hopkins’ Hannibal Lector’s fondness for the buttery bean, accompanied by a nice chianti and well… you know. Get past all of the excuses, cuz fava bean season is short and it’s almost over, and these beans are one of the best tastes of early summer. Seriously. Get to the market this weekend and nab as many as you can. It may seem like a lot but once you get down to what is edible it may not seem like enough….especially after you taste these nutty, bright green gems. 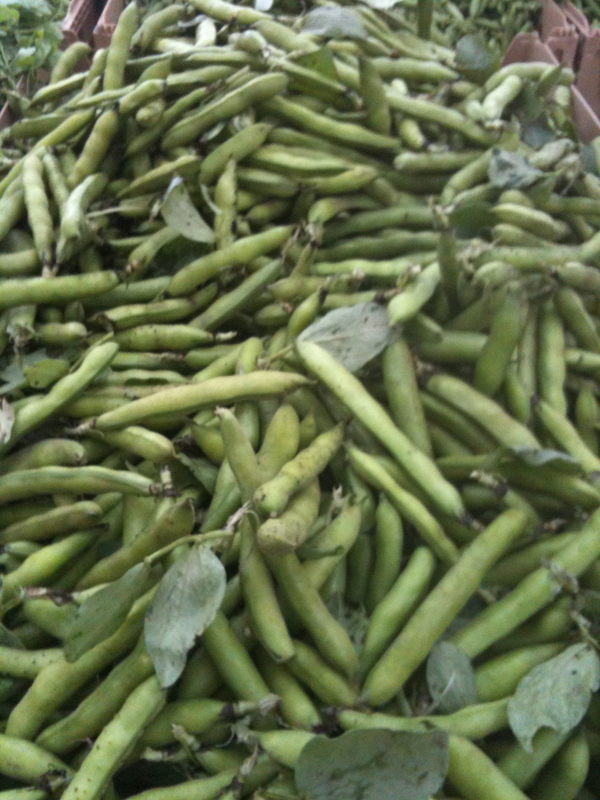 So you took my advice, bought a huge bag of fava pods, now what? 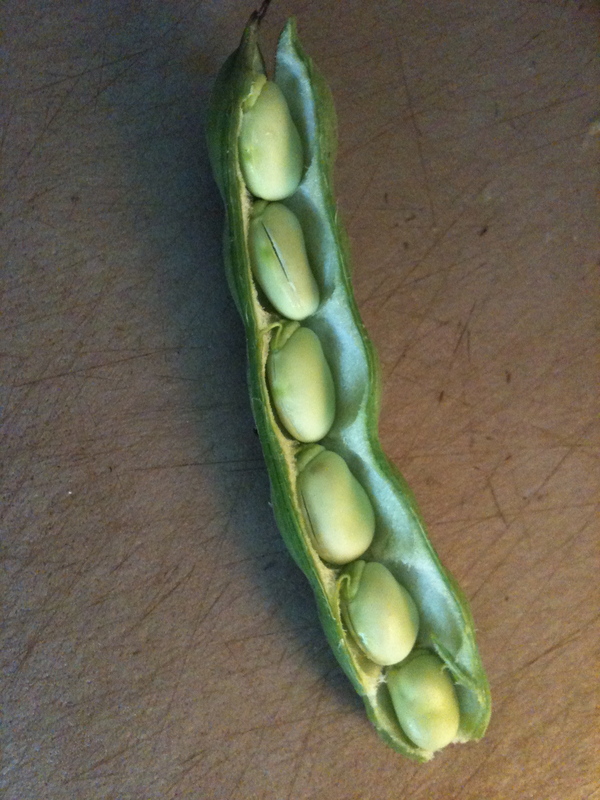 First remove the beans from the velvety-lined pods. This goes pretty quickly. See, that wasn’t so bad. Yay, all these beans, ready to start cooking. Woah, not so fast. Beans looking rather pale? Yep, that’s cuz they are still hiding inside their ‘skins’ (sorry lacking any fancy technical term here for said ‘skin’). Instead of trying to pry the beans from their skins raw, make things a bit easier: throw the beans in a pot of boiling salted water for 2-3 minutes. Remove from the boiling water and shock in some cold water. Strain. Now, prepare to ‘get your Zen on‘. Put a bean between your thumb and forefinger, give the skin a wee split (with your thumbnail or a knife) and then squeeze the bean out of the skin. Now there is the beautiful green legume we were looking for. Keep this process going and I swear it is pretty zen. All shucking, shelling, peeling and pinching done, you are left with a bowl of the most perfectly bright green little bites of early summer ready to puree, fry, saute, stew, or add to soups or salads. Being I worked up an appetite freeing the beans, I prefer to keep the recipe simple so I can get to the eating part, stat. 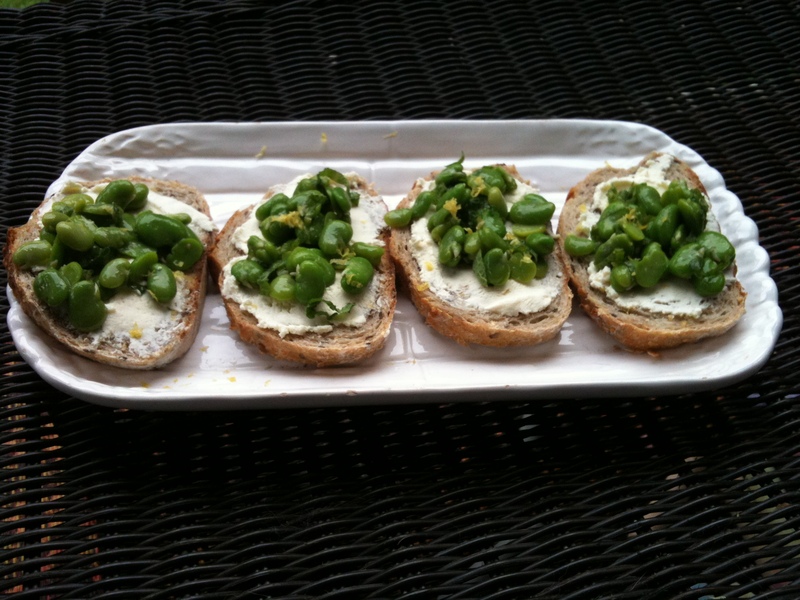 A simple crostini (oh heck, why bother toasting the bread) spread with a fromage blanc and topped with some favas. Pure. Heaven. Slice baguette into 1/2 slices. Toast or no toast. Your choice. In a bowl toss favas with olive oil, lemon zest and juice, mint, salt and pepper. Set aside. Spread a bit of fromage blanc on each slice of bread. Top with a spoonful of the fava beans. Arrange on platter. Serve. 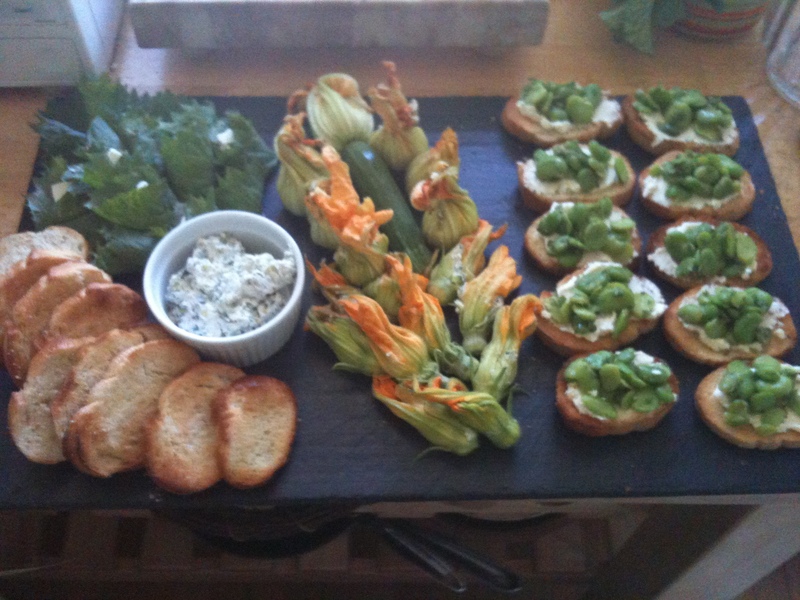 Fava Bean Crostini, Stuffed Squash Blossoms, Shiso wrapped feta - hungry yet?